I just discovered salt painting! All you (the kids!) 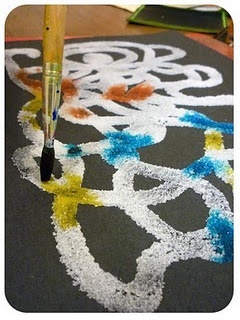 need to do is make a glue design on paper (dark paper works best), coat with salt, then gently paint the salt with water/food colour on a paintbrush and watch it spread. Kids will love the process AND the end result. This entry was posted in creative stuff and tagged craft, craft express, figure painting, glue painting, painting, salt, salt painting by rudyandthedodo. Bookmark the permalink. Love your DIY (4 young n old grownup kids)..Too awesome.Also your ‘meet a mama’ section is too good..